Saint Gobain’s STHT-R platinum-cured braid-reinforced silicone hose is an ultra-flexible, high-purity hose utilized for higher pressure sanitary transfer applications in the pharmaceutical and biotech industries. The manufacturing process is carefully controlled. Lot and batch traceability is readily available. Manufactured from the finest high-purity biopharmaceutical-grade silicone. Good for Vacuum and tight bend radius applications. Meacon Corporation has in-house production capabilities to fabricate custom hose assemblies made of Fluoropolymers (PTFE, FEP, PFA, ETFA), Silicone, Metal and various types of Rubber. This gives us the ability to offer short lead times and respond to emergency situations. Contact Meacon Corporation today to discover how we can help you manage your hose requirements. 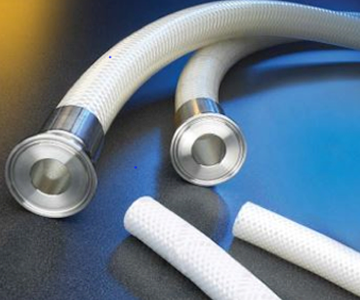 Flexible Smooth Bore FEP, PFA and PTFE-Lined Hoses for Pharmaceutical, Food and Beverage and Industrial applications. High Purity Platinum-Cured Silicone Hoses are clean room produced for critical pharmaceutical, medical, cosmetic and food applications. Convoluted PTFE Hoses are vacuum formed in an open pitched, helical design for easy cleaning. These hoses are rated for full vacuum, crush resistant and easy to flex, providing a far tighter bend radius than smooth bore alternatives. FDA-Approved Rubber Hoses are designed to transport a wide variety of fluids without imparting odor or taste and are specifically designed for sanitary suction and discharge applications. FDA PVC Hoses are designed to transport a wide variety of fluids without imparting odor or taste. Non-toxic, non-pyrogenic, and alkaline resistant. Permanent Radially Crimped Stainless Steel Fittings and Adapters. Reusable Stainless Steel Fittings and Adapters specifically designed for field fabrication.